I very love it! ------------------ J'aime vraiment beaucoup! I love this its Awesome. I think it is so ???? Love it! 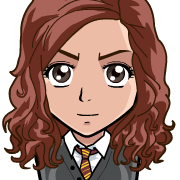 Hermione's always been my favorite character, related to her through and through.